We introduce you to Vention – a manufacturer of T-slot aluminum extrusions for automation infrastructure. Robot27 and many of our clients have experienced the long wait times and frustration dealing with some of the traditional extrusion vendors. If you have experienced this, take a look at Vention. In our Beginning Automation Series, we talk about How to pick the right gripper for your Cobot. Grippers may seem simple, but each type has its positives and negatives. Like everything else in automation, entire careers are made on just this small subset of the automation process. 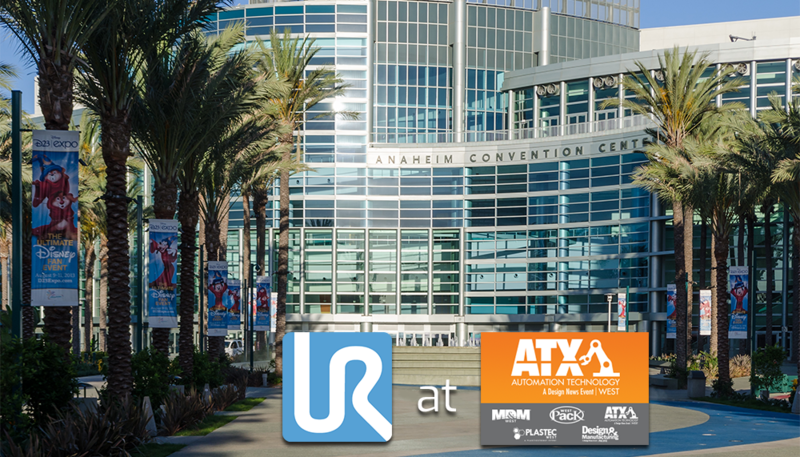 And, some news about Universal Robots at ATX West 2019 — the largest manufacturing expo in the West. If you’re tired of waiting weeks or months to have your t-slot extrusions or custom equipment delivered, Vention is the new company you need to know about. Thousands of miles of aluminum extrusion are in use every day in manufacturing spaces all over the country. Vention changes designing and delivering these solutions from a multiple-month ordeal into a few day success story. Traditional t-slot extrusion suppliers have large lengths in stock which have to be cut down on the factory floor by your workers which is time consuming and tedious. When custom cut lengths can be ordered, these pieces can often have multi-week lead times. Design in a CAD/CAM program can take days due to tedious calculations and interface limitations. Vention changes all of this. With a warehouse full of pre-cut extrusion lengths, plus all of the fasteners, supports, and attachments you need, Vention is able to ship most designs within 24 hours of receiving an order. Their easy-to-use cloud-based design interface reduces design time to a fraction of traditional CAD/CAM modeling. Vention has really done their homework on assembly, too – many of its fasteners are optimized to limit the frustrations faced by workers with other extrusions on the market today. This revolutionary company is changing the way manufacturing views t-slot extrusion. With a recently completed $17 Million capital investment campaign from Bain Capital, Vention has significantly expanded their product offerings. In addition to a host of new fasteners, extrusions, and interface improvements, Vention now offers actuators, motors, and logic controllers as part of their framework. 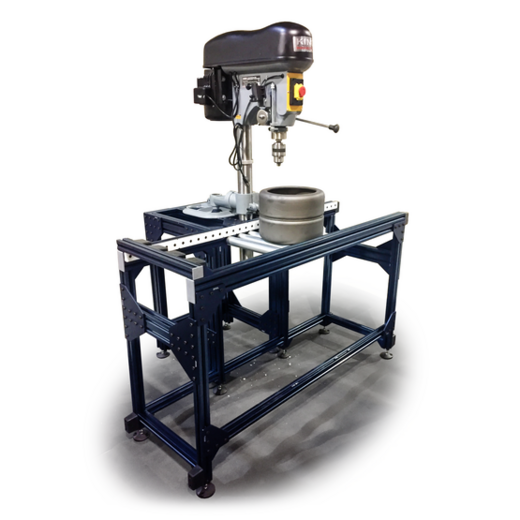 This allows manufacturers to design custom equipment for their workspaces with short delivery times and easy assembly. Vention grew 600% last year and is expected to meet or exceed that growth again in 2019. Robot27 utilizes Vention to provide sturdy, high-quality components for many of its automation cells. Vention’s speedy design and delivery windows help us deliver solutions faster than ever. 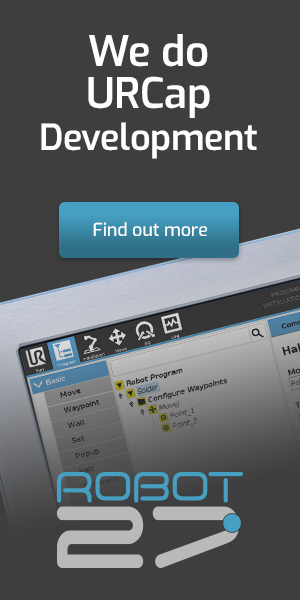 They even have the entire Universal Robots product line integrated into their design interface which makes Vention the perfect compliment for your collaborative robots. If you have a project that requires a custom t-bar extrusion component, Robot27 can provide the guidance you need to make sure your first Vention creation is a successful one. Ready to learn more about Vention? Stay tuned… We are going to feature Vention in a future edition of our Waypoint newsletter. In the meantime, check out some of the cool designs featured by Vention in their product gallery, or visit them. 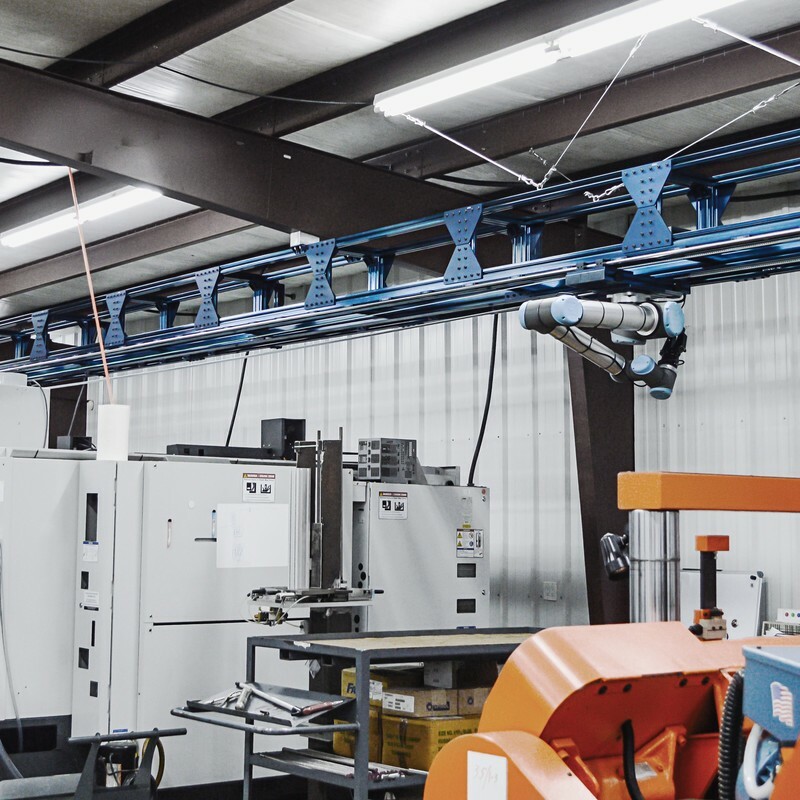 Overhead 7th axis for UR Cobot – Walt Industries, Inc.
Nearly every collaborative robot automation project requires the cobot to pick up or manipulate a part. 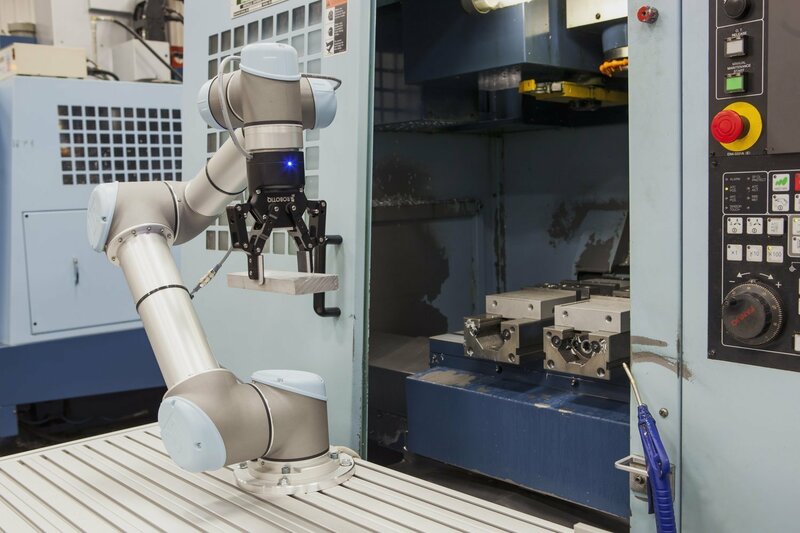 In fact, there is an entire category of end-effectors we call grippers – those which attach to the cobot to allow it to pick up or grip onto some work piece or part. There are nearly as many grippers on the market as there are parts needing to be picked up. In this article, we aim to steer you towards picking out the right gripper for your next automation project. Broadly, there are two ways that most grippers can be operated: via a source of compressed air or vacuum or mechanically through some electricity source. 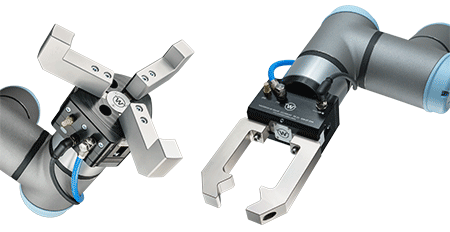 Deciding on the right gripper for your application depends largely on the parts you need to pick up and the resources already available in your work space. Pneumatic grippers require some source of compressed air either to open and close the gripper’s jaws which grip the parts being handled or to create a vacuum which is used to pick up parts. Jaw-type pneumatic grippers are useful for picking up small- to medium-sized individual parts which need to be manipulated precisely – think about an assembly application where the cobot is used to place or install several components onto a work piece. Vacuum grippers are generally best for picking up larger object or in situations where more precise manipulation is not required. A good example would be picking up cardboard boxes or other flat, smooth objects to move them from a conveyor to a pallet or from one workspace to another. Vacuum grippers come in many flavors as well, with suction cups or foam-covered vacuum chambers being just two examples. For manufacturing spaces that already have compressed air on site, pneumatic grippers allow flexibility and strength while utilizing existing resources at your manufacturing space. Electric grippers are perfect for many part-handling applications. These grippers also come in many styles – from grippers with integrated force sensing so that a specific amount of force can be applied to the part being picked up to grippers with four or five “fingers” allowing parts to be picked up similarly to a human hand to electrically powered versions of the pneumatic jaw-type grippers – there is a wide variety to choose from. 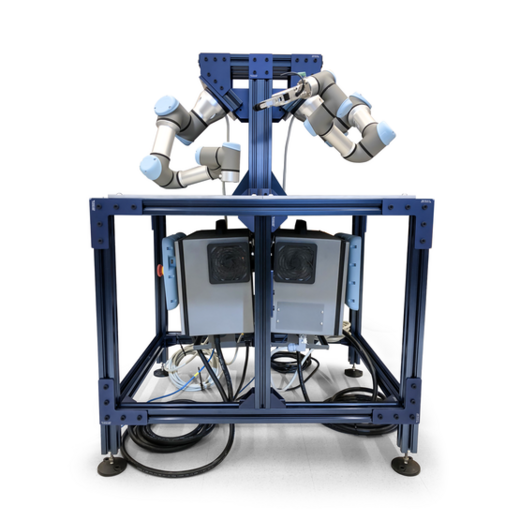 Many electric grippers available on the market today can be connected directly to the cobot for both control of the fingers and for the gripper’s source of power. Some have software components which make controlling them very simple with Universal Robots’ programming interface. Others require a simple 24 volt signal to open or close the jaws or fingers. Selecting the right gripper is very important for any application. 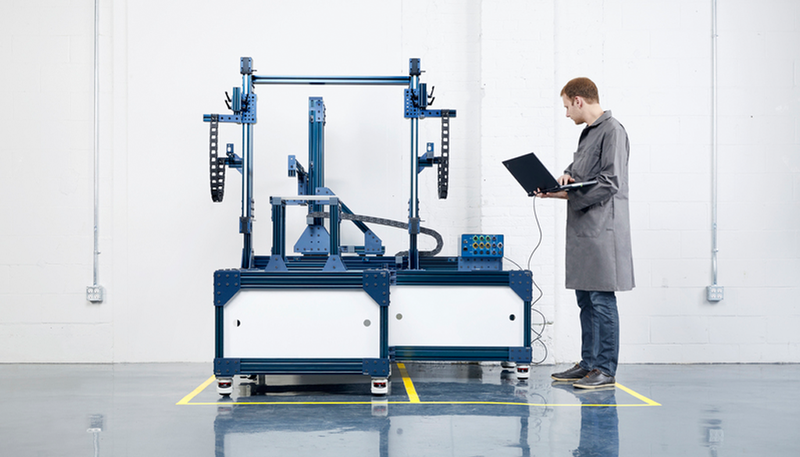 Robot27 provides the guidance you need to select the right one for your project. We can provide as much or as little help as you need – from complete engineering and programming of an entire collaborative work cell to consulting with your automation engineers to help them decide on the best hardware or the best design practices. Every year in early February, the largest manufacturing expo in the West convenes at the Anaheim Convention Center for three action-packed days. With nearly 2,000 exhibitors and over 21,000 attendees, ATX West 2019 showcases the latest and the greatest in manufacturing and automation. Universal Robots cobots were at many booths throughout the Convention Center demonstrating various software and hardware products for a wide range of applications. Some of the most innovative applications were hosted at UR’s own booth at the show. In fact, UR’s booth secured the #2 spot on the Industrial Equipment News’ Top 5 Technologies List For ATX West 2019. The first product featured in UR’s booth was a CNC interface designed for UR cobots by Versabuilt, a Certified Systems Integrator. Versabuilt’s demonstration showed how CNC machine tending could be achieved with an easy-to-program tool-changing and integrated CNC machine control with just a few selections from their software interface. Next to Versabuilt at UR’s booth was Visumatic‘s automated screw driving application. 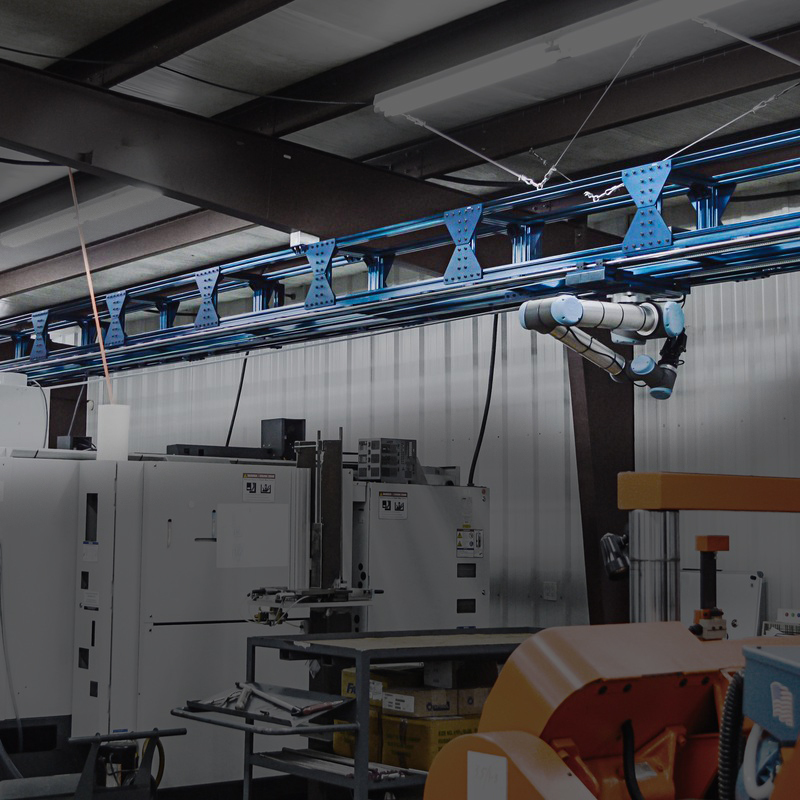 With automatic fastener feeders, delivery confirmation, and support for multiple different screw-driving routines, Visumatic offered an elegant solution to automate repeatable fastener driving. Also in UR’s booth was XPAK with a solution called ROBOX, a cardboard box assembling system. By entering the dimensions of the cardboard box into the cobot’s software interface, ROBOX would pick up a fresh, unassembled box from the supply pile, fold it, and tape it together all in just a few seconds. After passing through ROBOX, boxes were ready to be filled with myriad finished goods. In total, more than 13 different booths at the show had a Universal Robots cobot in their display. Each showed off UR’s ease of programming and safety operating around literally thousands of spectators.